The winner and runner-ups of World Mayor 2012 will be chosen based on the number of nominations in relation to the size of their cities and, more importantly, on the persuasiveness and conviction of testimonials received during this year's World Mayor Project. Below we publish a selection of comments received to date about WM nominee, Ayodele Adebowale Adewale Mayor of Amuwo Odofin LG, Nigeria. 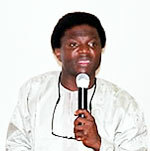 Comment: There are many mayors in Nigeria who think development approach to governance doesn't pay.Every month,they siphoned allocation meant for developing their cities and communities into private bank accounts.The world will always honour those who commit their efforts to better the life of others through development-oriented projects and good management of resources,equality and equity. Comment: The Mayor of Amuwo Odofin has supported the work of Tosin Jegede Foundation. Supporting us however he can: giving us space to work, allowing us hold meetings. The administration of Amuwo Odofin gave us our first project in 2010. The Local government has again been the first local government to verbally commit to sponsorship for the 1Child 1Book Project, where we will be giving all children in Government run schools a storybook of their own. The Mayor has committed to assisting us reach key stakeholders to ensure our project runs successfully to achieve our target. The local government is active in every area of development. This can be seen from the new face of the local government secretariat, to the improvements to remote communities and the various social and community building events the local government runs. Comment: He is a Man of Vision and his Administration has brought about quite a number of positive change in the Local Community. Comment: The mayor is very passionate about the environment and as such since he assumed office in 2008, he has created a great awareness on the need for a cleaner and greener environment.one of his first assignments on assuming office was to create a green club, the club has planted thousands of trees and flowers in our city, which are tended and nurtured on a daily basis. In the council's secretariat, there is a waste separation bin which encourages recycling, a way of saving the climate. the council has also organized the first climate change summit and has continued to support climate change exchange programmes. the council's premises is also beautifully lit at night with solar lamps. above all, there is a climate change unit, a first of it's kind in any local council in Lagos state.